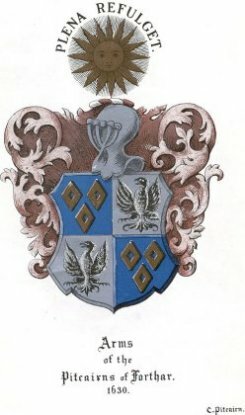 Henry Pitcarne succeeded as 10th Laird of the House of Pitcairn, ante 1456. In the accounts of William Moray of Gask, the sum of £13.6s.8d is put down as the relief of half the Barony of half the Barony of Drumgy due to the King by sasine, given to Henry of Pitcarne of the same lands October 1456. In 1480 Henry de Pitcarne has sasine of the lands of Forthar-Ramsay, and in 1481 he has sasine again of the lands of Drumgy, Perthshire. On the 9th June 1481 there is an instrument of sasine or precept of James III King of Scots, for infefting Henry de Pitcarne as heir of his father, George Pitcarne, with a 5th part, and 30th part of the lands of Colernay in the shire of Fife. There was another sasine or precept by the King to Henry Pitcarne of the lands of Kilmaron, dated 4th June 1481. Henry de Pitcarne was now the possessor of many lands. He owned Pitcarne in Fife, the Barony of Drumgy, and part of the lands of Cullerny and Forthir-Ramsay.